choosing the right spectacles can be tough for individuals. In today’s modern world your glasses reflect who you are. Men and women need and want more than just glasses. People want a frame with style, combined with quality and functionality. Therefore if you are looking for inspiration in choosing your on trend spectacles or Sunglasses, then you have come to the right place! Our dispensers will help you through the process of choosing your frame and lenses to the fitting and aftercare of your glasses. Our fully qualified optometrists, Gary Lesser, Nicolette Marsden and Georgina Kendrick are here to make sure you achieve perfect vision and our team of dispensers, Jo, Lyn, Mark and Carolien are at hand to help you choose the perfect frames. 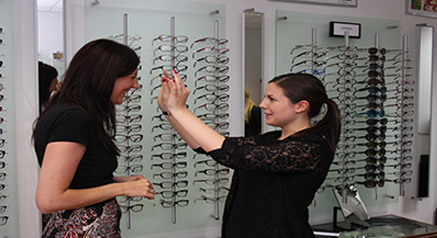 Our main aim is to make sure you leave our shop looking good, feeling happy and with perfect vision!